A blog by, and largely about, Canadian author David Nickle. For no money, really. So not really. But it's appearances that count. To see what I mean, scroll down to the very bottom of the yard. Even further. Further. Okay, there. ... and this time, not just from the regular kind of radio silence, either. Just spent a week at the Gibraltar Point Centre for the Arts at Hanlan's Point on the Toronto Islands, reading and critiquing and writing with a band of very fine writers from the U.S. and Canada. Gibraltar Point is one of several artists' residences in Toronto, operated by the Toronto-based non-profit organization Artscape. It's the only one of their residences I've spent any time at, but man, it's worth going back to. It's housed in an old school building, now converted into a sprawling collection of studios, meeting rooms and residences operated with genial efficiency by veteran Artscapers Ray Stedman and Lisa Cristinzo. Filled up with painters, photographers, sculptors, musicians, writers -- and, for a week each year, us. Using the boot-camp Clarion method (write, read, critique - repeat), it's intensive and productive and a lot of fun. This year, it was also a great relief. See, that story collection coming out next year, which you might recall was going to be called Monstrous Affections... well, after some talk, we decided on another title. A title, according to Sandra Kasturi, that more properly screamed DAVID NICKLE. A title that really needed a story underneath it to anchor the whole collection. A title that now, thanks to Gibraltar Point (and a week before it, a cabin at Lake Herridge, near Temagami, Ontario), I can confidently say has that story. The prologue to Volk, "Orlok," is waiting here. 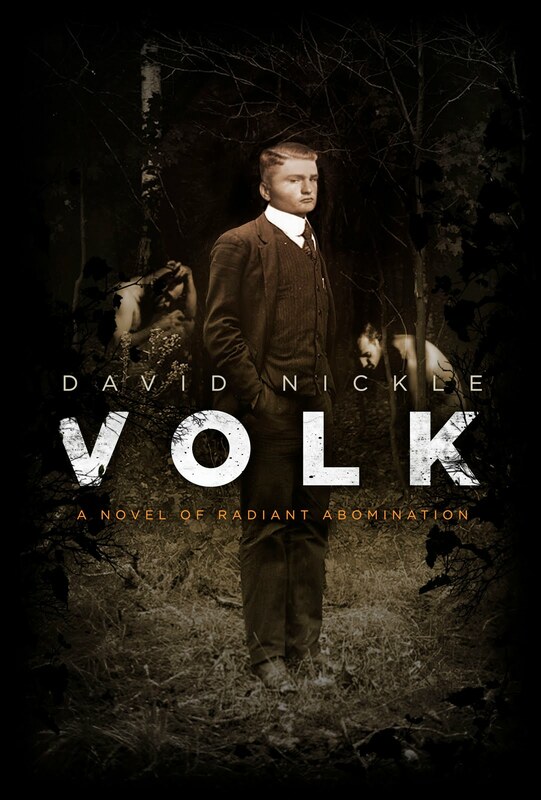 Volk is a sequel to Eutopia: A Novel of Terrible Optimism. An appetizer, best enjoyed with a cold glass of wine. This is the blog portion of my website, The Devil's Exercise Yard. It does all the things you've come to expect from blogs - although it won't be telling you what I'm eating, my mood, or whether my shirt needs laundering. Very occasionally, it may offer some insight to something you haven't thought about, or some update of news you haven't heard before. So keep checking it. Be obsessive. Give in to your inner web stalker. Click and click and click. It's the only way you'll be sure not to miss anything. From the website: I'm David Nickle, and I write stories. Most of them are what you'd call horror stories. But in the mix are science fiction, fantasy, and some stories that are just stories. Not one of them is true. I've had some of them published, in places like The Year's Best Fantasy and Horror, the Northern Frights series, the Queer Fear series, Cemetery Dance, On Spec, and a whole bunch others. I've only got one novel out (The Claus Effect, with Karl Schroeder), and a story collection, Monstrous Affections (all on my own) - but I'm working on adding some more to the list. From the blog: I'm also a journalist. I write for the Toronto Community News group of community newspapers in Toronto, covering municipal politics in the big city. It's a good gig. But I blog about city politics for the paper, so you probably won't hear much about that sort of thing here. Need to get in touch? Email me at davidnickle(at)gmail(dot)com.